The instructions below describe how to set up your environment if you want to contribute changes to the Umple project. Many people work on Umple using Eclipse, others use command line tools and plain text editors. You will need to use the command line for some steps. Before starting, you need to ensure that on your machine (Windows, Mac or Linux) you have Java 8, Apache Ant, Ruby and Php5 Installed. If you have a choice, we suggest using Mac or Linux as your platform as most developers find working with Umple using Unix commands easier than working with Windows. Optionally you might want to install Eclipse. You will be asked to "accept running of scripts," agree. You have several options to obtain Java, php, ant and Ruby. Homebrew, below, can install them all and is probably the simplest approach. Before following the instructions below, see what you already have installed. Java can be installed directly by downloading the latest jdk from Oracle. Php is already installed with the latest MacOS so you do not normally need to install it separately. Option 2: Github Desktop: Alternatively go to https://github.com/umple/umple and select the 'Open in Desktop' option. If you do this, you will be prompted to install Github Desktop if you do not yet have it installed. Then your repository will be downloaded into the location where Github Desktop installs its repositories. Do not download a Zip file from Github; that would just get the code, not a full repository. Run ant -Dmyenv=local -f build.umple.xml first-build -- this gets the Umple compiler used to compile Umple itself, which is obtained from the most recent successful push to git and built by http://cc.umple.org, and stored at http://dl.umple.org . You only need to do this the first time you compile, and then to grab the latest release. Run ant -Dmyenv=local -- This is called a 'full build' and uses the compiler you most previously downloaded. From now on, you normally just do this when you want to compile and test fully. This will take between 2 and 6 minutes depending on the power of your machine (and could take longer as the number of tests in Umple increases). It is also possible to do simpler compiles. See the CheatSheet. If the build takes excessive time, see the Troubleshooting section below. If this fails trying to load "junit" what may be actually missing is ant-junit.jar. Probably only an issue not building under eclipse. See the instructions at the end entitled 'Command Line building of Umple using Ant' for more command line options, if you plan to regularly using the command line. 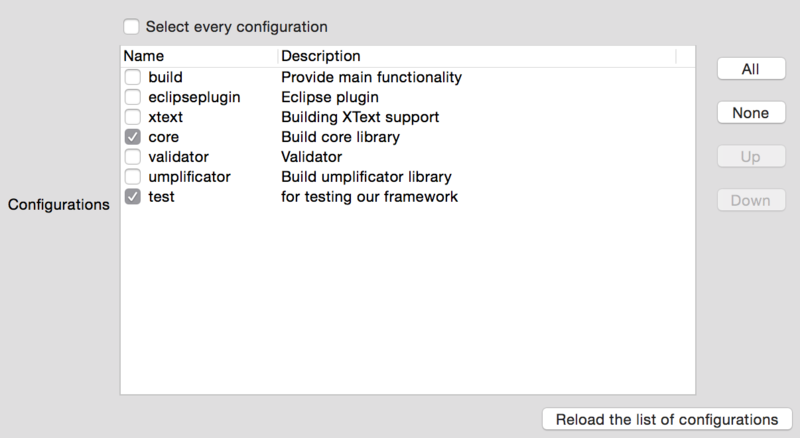 Note for Eclipse users: once you have followed the instructions below to get Umple setup for development in Eclipse, you can (optionally) configure Ant as an External Tool in Eclipse. Doing so allows you to trigger a full build from inside Eclipse, without opening a terminal and typing in commands. See this page for how to set this up. Once you have got your environment set up, you can create create pull requests to change Umple.. If you want to do development using command line tools, you are now done. But if you want to use Eclipse, then continue). Ignore this section if you don't want to use Eclipse initially. 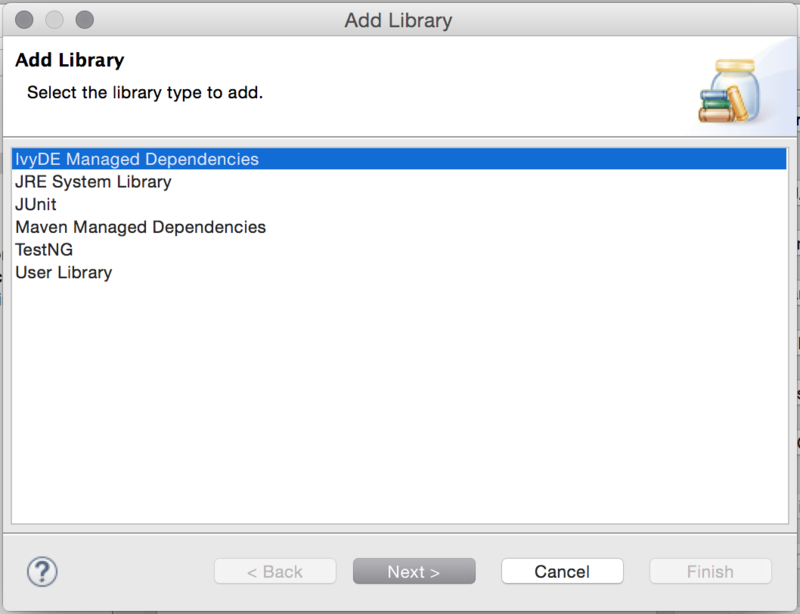 As your workspace for Eclipse, choose the trunk of your checked-out working copy of Umple. Using the Working Copy directory as your Eclipse workspace is not mandatory, but will simplify some steps. 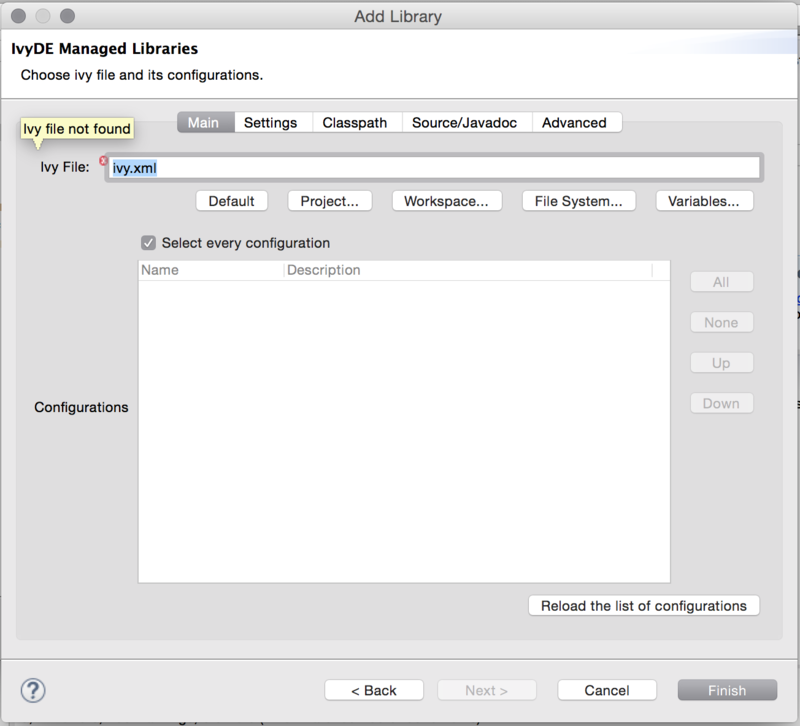 Open the Eclipse preferences, Window -> Preferences, select "Ivy -> Settings"
When you declare a directory to be your workspace, Eclipse places a hidden file there called .metadata to keep track of various Eclipse properties. This will be the first of several projects pointing to your checked-out code. Next, you need to add other subdirectories of the umple trunk as projects. You can repeat the above process or do the following. At the very least you need to add cruise.umple.nebula. De-select projects that you have no involvement with. The most important ones you will need are cruise.umple.nebula. Ensure any other projects in which your are planning to work remain selected. Press Finish. Go to the "Projects" Tab and add the project cruise.umple.nebula, as well as any other cruise.umple* project. cruise.umple/test Remove the other folders by selecting the undesired folder and then clicking on the "Remove" button. Note that this will not physically delete the folders or their content, we are just marking those folders as normal folders instead of source folders. Remain in the same "Source" Tab, select the first folder "cruise.umple/src-gen-umpletl", expand it and verify that there are no excluded folders. Do the same but this time for the "cruise.umple/src-gen-umple" folder. Go to the "Order and Export" tab and move the "JRE System Library" to the top of the list. Then press OK.
Click on the "OK" button to exit the properties page. At this point, your "cruise.umple" project should show no errors in eclipse. Use the Umple plug-in to generate all .ump source files. You do this by compiling this file: cruise.umple/src/Master.ump. First, open the file in Eclipse (double-click it), then click the Umple icon in the toolbar at the top left corner of the main Eclipse view. Since the above regenerates many files externally, refresh your projects. Select the projects and Press F5 or right click and select Refresh. The source code must compile at this point and the projects shouldn't have error markers. Refresh Eclipse Projects (F5). This is important, as when you run a build it changes the Umple version and Eclipse doesn't automatically reflect this. Since the version is different the tests will fail. There are at least Seven core Eclipse projects you may want/need to work on. cruise.umple // core, depends on Umple-Java,PhP,Ruby. This is the core Umple project. This project includes all Umple core files, such as the Grammar, the parser, the compiler, and all test files. cruise.umple.nebula This project is used for code generation. cruise.umple.eclipse Project that has been replaced by cruise.umple.xtext.ui. cruise.umple.xtext Not currently used. Project that contains all code for the parser, lexer and the code generated by the Xtext workflow (not UI). cruise.umple.xtext.ui Not currently used. Project that contains all UI code for the Umple Editor and Umple Actions. UmpleOnline Our PHP Web Application that brings you umple on the Web. UmpleToJava The template project for Java code generation. UmpleToPhP The template project for PHP code generation. UmpleToRuby The template project for Ruby code generation. Note: Master.ump file is the root file that calls all files that is needed for Umple to build. Umple developers use ant scripts to build the system. We frequently run these from the command line, although they can be run within Eclipse. See the next section if you need to install ant on your system. The Ant scripts are found in the ./build directory. build.umple.xml is the central file. Open it up and you will see the targets that you can choose to build. For convenience the extracted directory was moved to home, if you do not you will have to change the command for which you copy from later on. Note: The above command is assuming you moved the extracted tar file into your home directory. We no longer commit the generated code within the repository (remember Umple is written in itself and generates Java). Because of this, you need to bootstrap your environment and compile those into your system. (a small lie, as you might add new features that Umple then takes advantage of). Useful Ant Commands. See also CheatSheet. If the above fails, check that JAVA_HOME is set to your JDK1.8 folder. Search for the word 'fail' Don't rely on the phrase 'BUILD SUCCESSFUL'. Also try disconnecting from the network if it gets stuck doing template.test and/orbefore issuing the above command. There seems to be a problem on some wifi networks where DNS queries done in every test take excessive time. After you have dowloaded the file, extract the contents into a folder. NOTE: the simpler the path the easier it will be for later steps for example C:\ANT. Now that ANT is working, download the ant-contrib file from the downloads page. Extract it and move the ant-contrib .jar file inside into the "lib" folder of ANT. Problem: when you run the command ant -version and you get the error "Unable to locate tools.jar..."